MBA I.V. 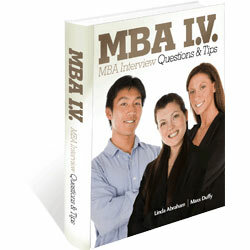 : MBA Interview Questions & Tips, an instantly downloadable ebook, shows you how to ace your MBA admissions interviews so you can attend the business school of your dreams. A succinct, 98-page guide to successful MBA interviews. Interview insights from professionals with vast MBA admissions experience. Nuts-and-bolts suggestions for your MBA interview. Convenience – The ebook is instantly downloadable. There’s no shipping or waiting. Purchase and download MBA I.V. : MBA Interview here.